From 1861 until 1965, the Portpatrick and Wigtonshire railway - the Port Road, as it was familiarly known - meandered across south western Scotland, from Dumfries to the ports of Stranraer and Portpatrick. Despite its usual name, it wasn't built as a single through route; though later part of the Glasgow and South Western Railway, it had a history as picturesque as its line. The most spectacular part was built by an independent company known as the Portpatrick Railway (thanks to Ewan Crawford for the page linked to), which ran from Castle Douglas to the harbour for the Irish Mail packet steamers at Portpatrick - this was the shortest sea crossing to Ireland, and was before the superior harbour at Stranraer was developed as the speed of steamships improved. Although the route closed in 1965, many of its substantially-built structures survive today. 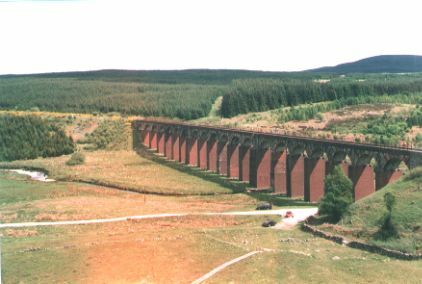 I visited the area in May 1998, and took photos of three of the relics - Loch Ken viaduct, New Galloway station, and the Big Water Of Fleet viaduct. You can take a photo-tour of the three, or dip into each one. 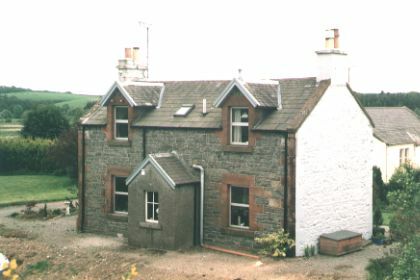 After leaving Castle Douglas (where it made a junction with the Castle Douglas and Dumfries Railway), the trackbed of the Portpatrick Railway runs west along the north shore of Loch Ken. Where the loch bends northwards, the line leaps across it on a three-arch bowstring viaduct. The next station westwards was New Galloway. The trackbed from here to Gatehouse Of Fleet is now a foot- and cycle-path, but unfortunately I didn't have time to visit the charming halt at Loch Skerrow, a beauty spot once accessible only by rail. The viaduct across the watercourse known as the Little Water Of Fleet was blown up as an Army training exercise shortly after closure - some people say it was to prevent any chance of the line being re-opened. The accessible path continues to Gatehouse of Fleet station (some seven miles by tortuous moorland road from the small town of that name). By repute, this was the station most remote from the place whose name it bore ! The next few miles of trackbed beyond there are only walkable with some effort, as parts of it are flooded, and most of the remaining bridges have been demolished. However the course of the line may be followed as far as Portpatrick, and the perfect book for both walker and railway historian is "The Lost Railway Lines Of Galloway", writen by Alasdair Wham and published by GCB of Wigton (ISBN 1 872350 96 8). Mr. Wham and his son walked all the lines from Dumfries to Portpatrick and Kirkcudbright in 1996, and the account, enlivened with historical detail, makes a fascinating read even for the armchair walker.